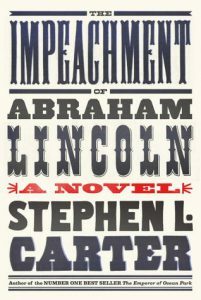 Stephen L. Carter’s thrilling novel takes as its starting point an alternate history: President Abraham Lincoln survives the assassination attempt at Ford’s Theatre on April 14, 1865. Two years later he is charged with overstepping his constitutional authority, both during and after the Civil War, and faces an impeachment trial . . .
Twenty-one-year-old Abigail Canner is a young black woman with a degree from Oberlin, a letter of employment from the law firm that has undertaken Lincoln’s defense, and the iron-strong conviction, learned from her late mother, that “whatever limitations society might place on ordinary negroes, they would never apply to her.” And so Abigail embarks on a life that defies the norms of every stratum of Washington society: working side by side with a white clerk, meeting the great and powerful of the nation, including the president himself. 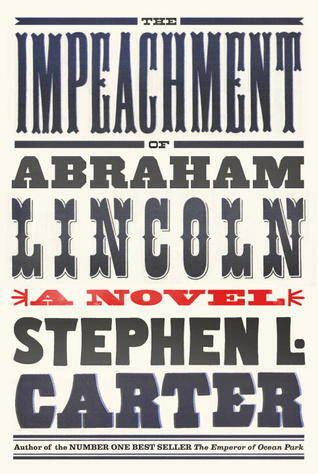 But when Lincoln’s lead counsel is found brutally murdered on the eve of the trial, Abigail is plunged into a treacherous web of intrigue and conspiracy reaching the highest levels of the divided government. (Description from Goodreads.) We have 10 paperback copies available.